France’s iconic national stadium, the Stade de France in St Denis, Paris, has successfully completed the installation of a new NEXO sound reinforcement system, which replaces an older NEXO system, the first elements of which were installed in 1997 when the Stade was erected, in time for the World Cup football in 1998. Purpose-built for events as well as its primary sporting engagements, football and rugby, the Stade de France is a 80,000+ capacity venue. Its distinctive elliptical design, by architects Aymeric Zublena, Claude Constantini, Michel Macary and Michel Regembal, is distinguished by the immense floating roof, which never touches the stands, resting instead on 18 pillars. Another remarkable aspect of the stadium’s design is the cushion of air that allows the lower stands to slide out in approximately 72 hours, depending on the different configurations needed, allowing the stadium to be reconfigured to house a running track for track and field events, or to be used for prestigious concerts and spectacles. With all its different uses, this huge structure is often considered to be a stadium for the 3rd millennium, and, after 14 years of successful service from its NEXO Alpha sound system, the Stade de France required an equally forward-looking SR design. French event production company and installation specialist Melpomen was called in, to work alongside key component suppliers NEXO and AuviTran and the Stade de France sound department, led by Fabien Budnik. Melpomen project manager Sylvain Brottes coordinated the design and installation of a 13-zone audio system, featuring nearly 300x NEXO GEO S12 loudspeaker cabinets, specially enhanced for this project, and nearly 30x RS18s, the first time NEXO has delivered these sub-bass units into a sports stadium install. • control of the operation of the system, which allows any signal to be sent to any zone from pitch to car-parks from a single control room. The NEXO sound system is split to cover the upper and lower parts of the stadium. 40 clusters of NEXO cabinets are flown from the roof for the stands: 7x S12s are directed at the upper levels, while a separate array of 6x S12s faces directly down towards the lower levels. Another 32 cabinets of S12 are used for fill at ground level. RS18s are flown, 27 in total. “We can change any loudspeaker in any cabinet in 30 minutes, although the NEXO NXAMPs provide excellent protection,” says Fabien Budnik. The high level of diagnostic control is provided by 32x NXAMPs, tucked away in 9 amplifier rooms in the stadium roof. These provide full diagnostic information to the control room, warning of a problem in a rack even if functionality is not actually affected. An additional 8x NXAMPs are used to control a separate PA system for the stadium plaza, the open areas surrounding the stadium, which is equipped with NEXO GEO S8 compact line array modules. The NXAMP is an EtherSound amplifier, and the Stade de France system runs on a full EtherSound network. Such is the level of system control that any input can be sent to any output at the Stade; publicity announcements for the car parks, or a message to a specific area of the grandstand. The connectivity is via fibre optic cable, which runs from the 11x Yamaha SB168-ES stageboxes; ten kilometres have been installed in a ring architecture, which has itself saved a huge amount of cabling for the installation team. “The main advantage is in flexibility, interoperability and monitoring with minimum latency,” explains Jeremie Weber of AuviTran. “Although there are less than 20x AuviTran units in the stadium (1xAVM500, and 1x AVNF49 unit in each of 9 racks for the fibre optic safety ring control and management), the network offers matrix capability of 320x320, and the Stade is currently using around half of that capacity. Pairing AuviTran with NEXO has become a regular design solution for stadia in France, and recently two football stadia in Morocco have bought into the combination. One of the key components of this successful formula is the new customised S12-ST cabinet, a special-order variation on NEXO’s popular S12 line array design. 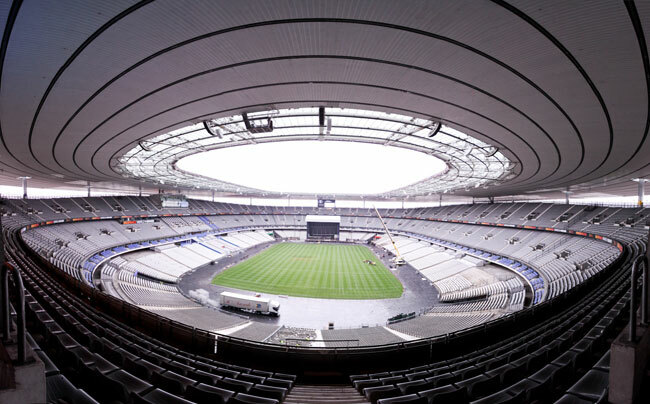 “We have modified it with a +3dB treble boost to provide the output necessary for a loudspeaker that is installed so far above its listeners: 45 metres above, in the case of the Stade de France,” explains Paul Massiani, NEXO’s stadium sound manager. Installation of the new system began in September 2010, and the Stade de France project team, led by Stanilas Degardin, planned for a short period of overlap with the old NEXO Alpha system. One of the additional benefits of the Melpomen/NEXO design is that visiting production companies, bringing in high-profile concert artists and theatrical spectaculars, can opt to tie into the stadium’s system to cover the upper levels of seating.